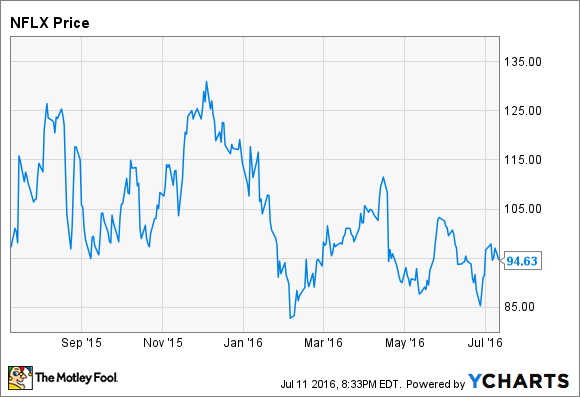 Many analysts have turned negative about Netflix recently -- but not for very good reasons. The stock market may have ended the day at a record closing high on Monday, but that wasn't the case for Netflix (NASDAQ:NFLX). At the end of last week, shares of the streaming video leader were more than 25% below the all-time high set in late 2015, and they fell more than 2% again on Monday, driven by a wave of negative analyst sentiment. Netflix Stock Performance, data by YCharts. Several key criticisms of Netflix seem to crop up again and again these days. However, none of them holds up to serious scrutiny. In recent years, bears have repeatedly pointed to Netflix's high content costs -- and especially its future content obligations -- as a sign that the stock is overvalued. Netflix ended last quarter with $12.3 billion of streaming content obligations, up from $9.8 billion a year earlier. One bearish analyst cited by Barron's expects this to grow to $14 billion by the end of 2016. This number may seem high for a company that is expected to generate less than $9 billion of revenue this year. However, these content obligations are spread over many years. In fact, just 42% of the content obligations come due in the next year -- a much more manageable $5.16 billion. Indeed, Netflix has been very up-front about how much it plans to spend on content each year. For 2016, it expects to record more than $5 billion of content expense on its income statement and spend more than $6 billion on a cash basis. Netflix now spends billions of dollars annually on content. Image source: The Motley Fool. This is still a lot of money, but content is by far Netflix's biggest expense. Without content, there wouldn't be a business. Importantly, Netflix has shown an ability to leverage its content costs over time. In 2014, Netflix's revenue increased 26% but its "cost of revenues" -- a proxy for content costs -- rose just 20%. More recently, content costs have been growing faster than revenue, but that is a temporary phenomenon driven by rapid international expansion. A second issue that has received a lot of attention recently is Netflix's slowing domestic growth rate. For example, analysts at Jefferies recently downgraded Netflix stock, stating (among other things) that it will take longer than expected to reach the company's goal of having 60 million to 90 million domestic subscribers. It's true that Netflix's domestic growth rate is slowing in percentage terms. And it added "only" 5.57 million domestic subscribers in the 12-month period ending in March. That compared to 5.73 million net additions in the previous 12-month period and 6.50 million in the 12-month period before that. Still, these figures show that the absolute growth rate is slowing modestly, not crashing. Netflix ended its first quarter with 47 million domestic subscribers, so it is already pretty close to the low end of the target range. Furthermore, Netflix's average revenue per user will rise significantly in the next few quarters as price increases start to hit users whose subscription plans were previously grandfathered in with lower prices. Thus, even if the percentage growth rate of Netflix's domestic subscriber base is slowing, its domestic revenue could increase by about $1 billion on an annualized basis by this time next year. Not too shabby for a company supposedly facing slowing growth! Finally, some analysts have pointed to Brexit as a new risk factor for Netflix, including Needham & Company's Laura Martin. The separation will likely reduce economic growth both for the United Kingdom and for the European Union more broadly. That said, it's hard to see economic conditions getting so bad that people have to cancel their Netflix subscriptions. If anything, belt tightening might cause some people to trade down from a full pay-TV package to Netflix. (That said, pay-TV costs tend to be much lower in Europe than in the U.S.) For example, Netflix has grown steadily in Brazil in recent years, despite the huge economic slump there. Netflix is in the midst of a turbulent transition period. In the past few years, it has been growing rapidly but has barely been profitable. Going forward, Netflix's revenue growth will slow, but its earnings growth will finally take off. This transition is already giving investors a bumpy ride -- and some pundits are predicting even bigger stock price declines ahead. But Netflix is well positioned to emerge from its transition in a few years as a highly profitable and still-growing company. If the stock continues to fall, it could create some great buying opportunities for long-term investors.